In my previous blog series, Strategic Planning for New Ventures, I showcased an example of a disruptive innovator in Veracyte, leader in thyroid cancer diagnostics. Veracyte pursues the specialized CLIA lab business model, offering a unique, high-value test that cannot be obtained elsewhere. 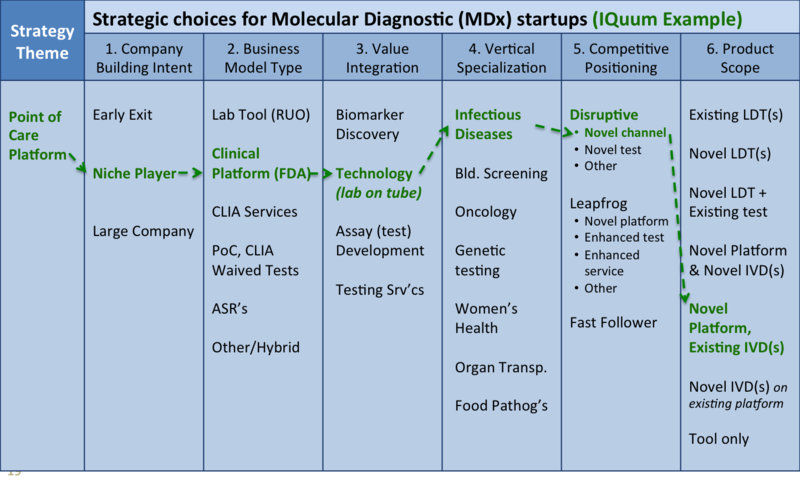 In this blog, I profile another innovator, IQuum, which is pursuing the other common model in molecular diagnostics, the FDA approved, In-Vitro-Diagnostics (IVD) platform/consumable provider (aka razor/razor-blade business model). Coincidentally, IQuum was recently acquired by Roche for $275M plus $175M in performance based milestone payments. IQuum’s product innovation is their Lab-in-a-Tube offering, which allows for healthcare workers to perform existing laboratory tests at point-of-care. Today, most lab tests are reserved for highly trained specialists in centralized reference lab settings, adding a great deal of waste to an already burdened health care system. The introduction of a simple-to-use, rapid, point-of-care diagnostic platform changes the game from an expensive and time consuming logistical crucible to a simple, democratized operation with substancial upside benefits for patients (in the form of faster turnaround times for results). IQuum is disruptive not because it offers novelty in test results (it offers existing tests such as an Influenza A/B assay). IQuum is disruptive in that it changes the business model from centralized testing to a point of care setting and from highly skilled, single-purpose specialists to a wider spectrum of generalist health-care workers. IQuum provides valuable lessons for companies in any industry trying to disrupt incumbents – don’t attack from the top, create a different value network. Don’t necessarily create new consumption; change the pattern of existing consumption to a more convenient time and place. In this ‘B2B’ example, change the level of training necessary to operate a certain type of tool, from narrow-licensed specialist to a generalist (democratize the usage of anything valuable). Looking at IQuum from the perspective of a Strategic Choice Canvas, it is obvious that they have been congruent with their strategic choices – their lab-on-a-tube novelty opened the possibility for business model innovation, not necessarily new-to-the-world diagnostic tests (which are the most expensive part of the diagnostics business). IQuum realized that it is too difficult to invent both novel diagnostic technology AND novel applications or assays for that technology (especially as a cash-strapped new entrant). IQuum further understood that incumbents were focused on the high-throughput, central lab channel and chose instead to focus on lower-throughput, point-of-care (point-of-need) channel, which through lower cost and increased convenience, should in theory fight non-consumption of certain molecular tests (a positive sum game). Molecular Diagnostics is one of the toughest segments of the healthcare industry – Having said that, innovators such as Veracyte and IQuum are showing hat the key to success is disruptive innovation (indirect fights), not incremental improvements trying to unsettle the large and powerful incumbents directly.